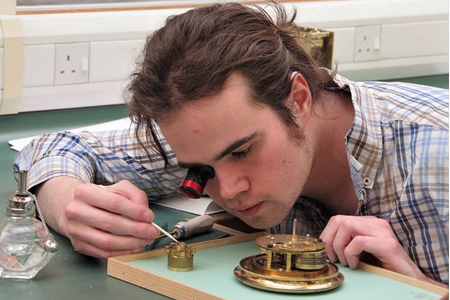 A crucial part of this conservation project is to fully document the clock and its parts. A significant proportion of the overall time spent is to record, photograph and sketch the existing mechanism and to attempt to understand some of its history. Of all the different aspects that the project entails the one of highest importance is to try to identify the music programmed into the organ and to restore it to working order. This is also the key outcome upon which the funding for the project was secured. So it won't surprise you to know that we made an early start on this. As this project is running to a strict time deadline, a team of two conservators (Malcolm Archer, leading the project, and me, Jonathon Kelly, in a conservation intern role) are working full time on the project with significant contributions from tutors and students of West Dean conservation departments. Fig.1 The barrel organ showing the pin barrel at the top, the organ movement on the right hand side, the bellows underneath and the ranks of pipes at the back. Points to note about barrel organs. 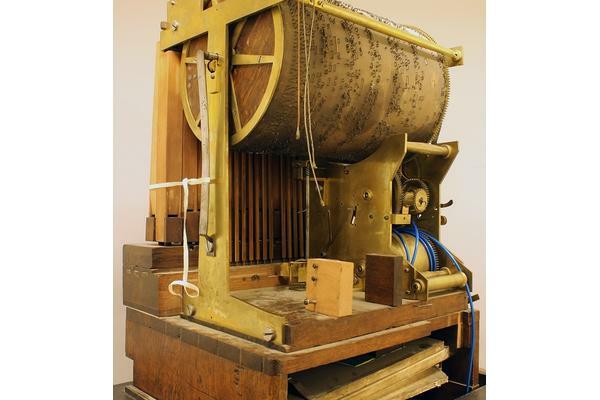 In essence a barrel organ works in the same way as a typical pipe organ except rather than having keys for a human hand to play, as the barrel rotates the pins on the outer surface lift a key to play the note. For a prolonged note a bridge is used and for a quick succession of notes a series of pins grouped close together, often referred to as a trill. The barrel always rotates at a constant speed. The great advantage of a barrel organ is that the pins and bridges which lift each note are played with musical precision each and every time so the music always sounds exactly the same. This also means that the skill of the person who pins the barrel has a direct bearing on the accuracy of the rendition. The Pyke organ has 21 keys and 62 pipes in three ranks with three stops. Each of the 21 musical notes plays the same note in 3 different octaves (the base G only has 2 pipes). The organ plays 8 different tunes. The desired tune has to be manually selected before it plays. 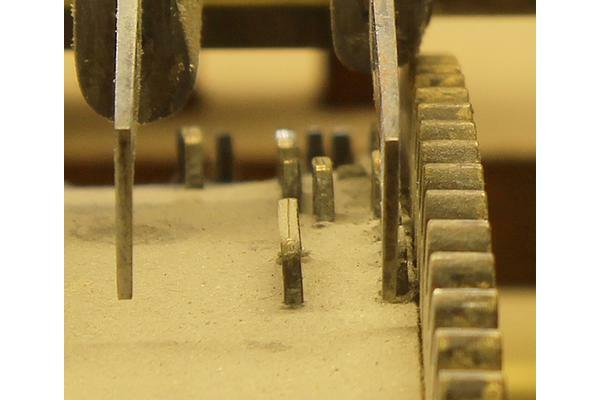 As a tune is selected the barrel is shunted sideways in small steps so a different line of pins are aligned with the key. In other words for each of the 21 keys there are 8 lines of pins right next to each other. 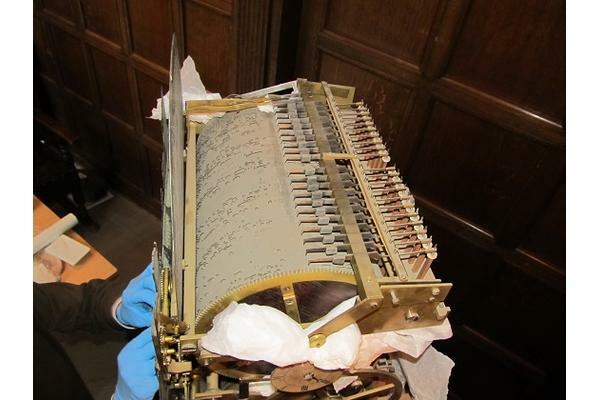 Our starting point for identifying the music was the organ itself in the condition received and the evidence contained on it both physically and historically. 1. Recording the organ music. 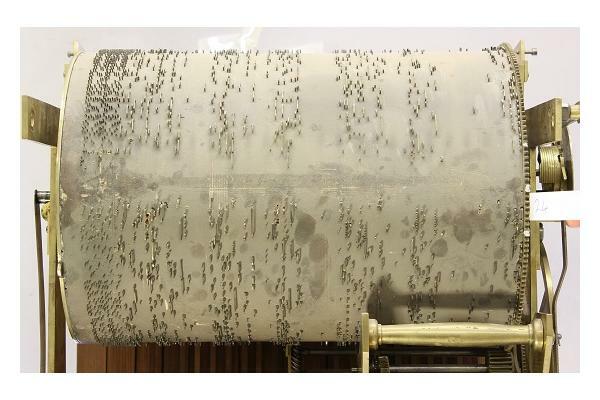 In its received state the organ would still play music albeit creaking and straining as it did so! However various factors such as, broken or missing pins and bridges on the barrel, a worn tune change mechanism, side play in the keys (leading to misalignment between keys & pin) and incorrectly adjusted valves resulted in some notes either playing when they shouldn't or not playing when they should. Fig. 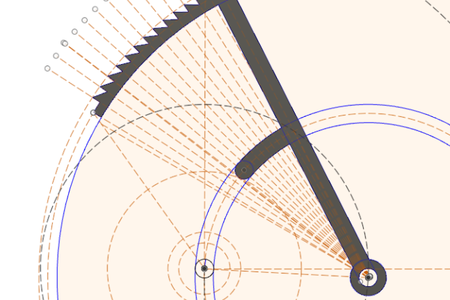 3 shows an example of this (the barrel rotating toward the viewer in this image). Fig. 3 An example of misalignment of a key to a bridge where a key could fail to be lifted. Other factors contributed to poor performance such as leaking bellows, dried up oil on bearing surfaces (which increases friction and wear to the mechanism). In previous years a solution to this had been to add a heavier driving weight to force the organ to work and compensate for many of these problems. All eight tunes were recorded after measures were taken to minimise the above mentioned problems. Fraser Duncumb from the musical instruments department recorded the music as MP3 files using professional sound recording equipment. Although all eight tunes were recorded for their full duration so many notes were still playing incorrectly very little of the music sounded very musical. It was hoped that from these recordings external specialist musical advice could be sought to identify the eight tunes however so unrecognisable were the recordings that full attention was turned to the second approach of identification. 2. Extracting the music from the pin barrel. 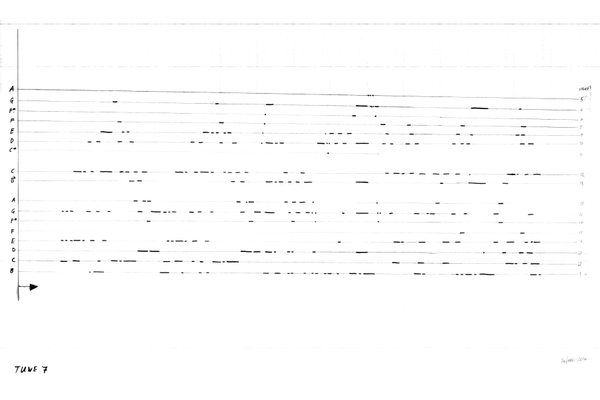 The second approach was to extract the music programmed on the pin barrel and transcribe sheet music. From this external musical advice would be sought for identification. • The barrel was marked up on the gear teeth to divide it into 24 equal divisions. • A high resolution 2D image of the cylindrical barrel was produced using an SLR camera by taking photographs directly in front of the centre of the barrel. A photo was taken, the barrel was rotated by one division, another photo was taken, and so on until there were 24 shots covering the entire barrel. • The 24 digital photos were printed and carefully pieced together to make an accurate continuous long image. This made the flat representation of the barrel as if the outer layer had been peeled off: see Fig. 5. • Eight copies of this the image were produced at A1 paper size, one for each tune. • Then a painstaking job! Malcolm marked up a vertical line of pins and bridges for each of the 21 keys for each tune. In numbers this works out as 21 keys x 8 tunes = 168 separate lines (well over 2000 individual pins and bridges). The risk here was that so many of the pins were bent over or missing, a high degree of concentration and mechanical interpretation was required to do this. 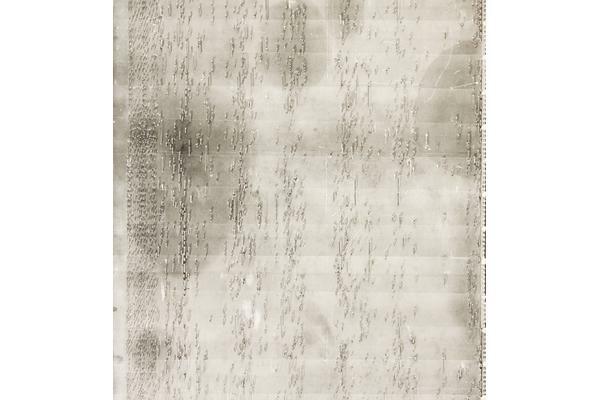 • A1 sized traces of these marked prints were made to show a linear line of dots, dashes and spaces for each key. The traces were scanned and then printed on plain A3 paper (Fig. 6). (By the reducing the scale, the scale of any small errors is also reduced). • From these sheets Fraser Duncumb from the West Dean musical instruments department played and transcribed the tunes to sheet music. Quite an involved and lengthy process but the resulting music sounds like organ music. Now that we have more credible audio recordings and some sheet music, the challenge is to seek identification of the music and the composer-stay tuned. As posted on the first blog entry, the estimated production date of the organ is 1765, however the pin barrel has a signature dated 1817. Fig. 7. 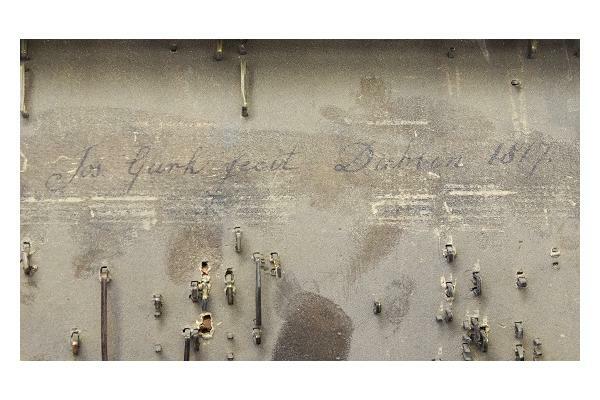 Organ barrel signed Jos Gurk fecit Dublin 1817. Note missing and broken pins below the signature. 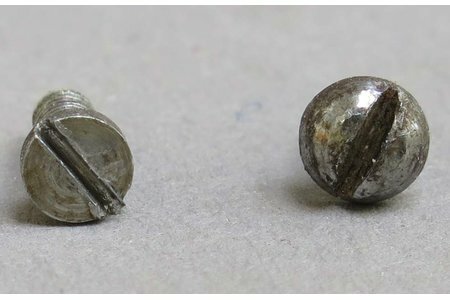 This difference of 52 years means either the barrel is a replacement or it has been re-pinned by the signatory Joseph Gurk  who we now know was a musical instrument maker originally apprenticed to Joseph Niemecz  the talented musical instrument maker of the composer Joseph Haydn . Haydn wrote many pieces for clockwork organs . It is possible although maybe less likely to find direct musical evidence through this historical link. However this history will hopefully at least contribute to the story of the Pyke organ clock.